Light & Shifty Winds Challenge Sailors on Day 1 – 2018 WIM Series Finale at Carlos Aguilar Match Race. St. Thomas, U.S. Virgin Islands (November 29, 2018). The sea-filled volcanic crater that is today the Charlotte Amalie harbour is picture postcard famous for its lush green mountains rising to over 1500-feet high. It is this topography that created a continual curve ball of wind shifts that challenged every one of the 12 international teams competing on the first day of racing in the 2018 Women’s International Match Racing Series (WIM Series) Finale hosted at the Carlos Aguilar Match Race (CAMR), today through Sunday. Combined with light 5 to 10 knots of breeze, it was a day where even the smallest mistake or break could mean the difference between winning and losing. By day’s end, with 8 flights in the first full round robin completed, three teams emerged undefeated. 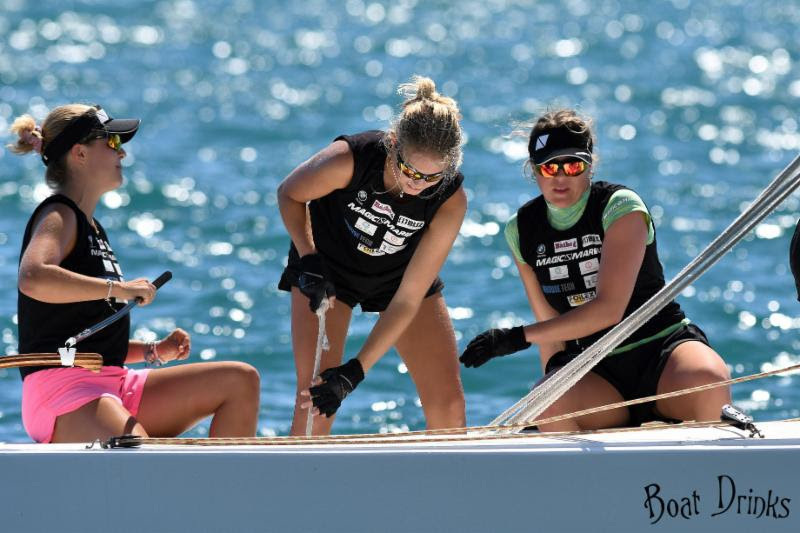 Courtois, whose Match In Pink by Normandy Elite Team of Maëlenn Lemaître, Louise Acker and Sophie Faguet, says familiarity with the boat is something she gained during the 2016 event and it served her well today in earning five wins. “It’s a small, light boat that is good for match racing,” says Courtois, of the IC24 used by the CAMR. An IC24 is a modification of a J24 innovated by two members of the St. Thomas Yacht Club. The USA’s Morgan Collins also sailed in this event in 2016. She found past experience aboard an IC24 and sailing in the Charlotte Amalie harbor a benefit. “I like the boat. It’s quick to respond. I also like to sail in offshore breeze in shifty conditions and that’s what we had in the harbor. Knowing the racing area, especially the start and tricky area near the sea wall, is an advantage. Basically, our goal was to get the boat moving well as a team and build our speed,” says Collins, who is the assistant sailing coach at Old Dominion University (ODU), in Norfolk, Virginia. One of Collins crew, Bridget Groble, is a current student and member of the ODU sailing team. Groble is using the WIM Series Finale at the CAMR to gain valuable experience for collegiate level match racing. 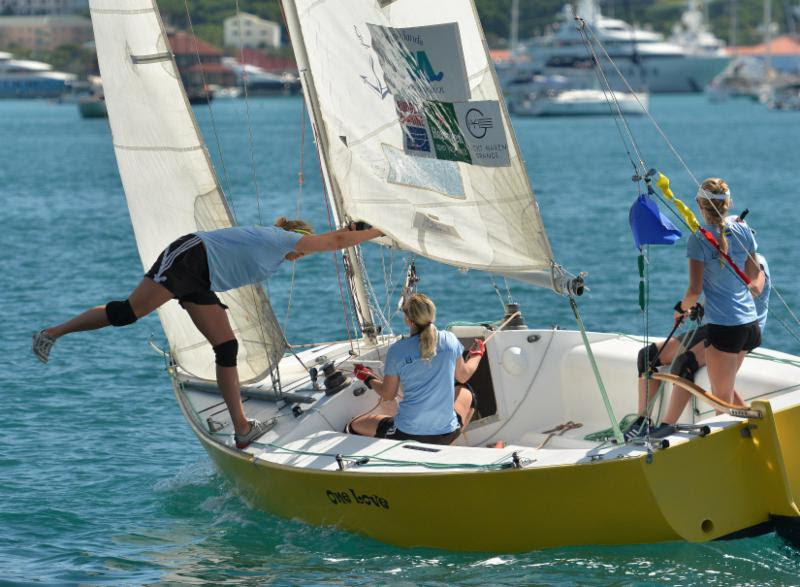 Cara Vavolotis and Shannon Wilkins are the two other crew members on Collins’ Caribbean Wind Racing team. The team finished the day with one win and four losses. Yet another 2016 WIM Series Finale at the CAMR veterans is Sweden’s Linnea Floser, who this year is competing with her Peregrine team of Hanna Ericksson, Sarah Ragle and Ann Johnson. “The winds were definitely shiftier than we are use too and we had several close matches. The goal was not to make any big mistakes and capitalize on the small details to go faster. We won our last match of the day and I think what helped was a learning curve, trying crew in different positions and getting more speed upwind. With those lessons learned, we’ll be a more dangerous team to beat tomorrow,” says Floser, who started match racing career in 2015 and literally warmed up for this event by spending a few days earlier snorkeling on the neighboring island of St. John. Known internationally for introducing young sailors to the sport, CAMR organizers work cooperatively with the V.I. government and V.I. Department of Tourism in its efforts to get more of the island’s youth out on the water. 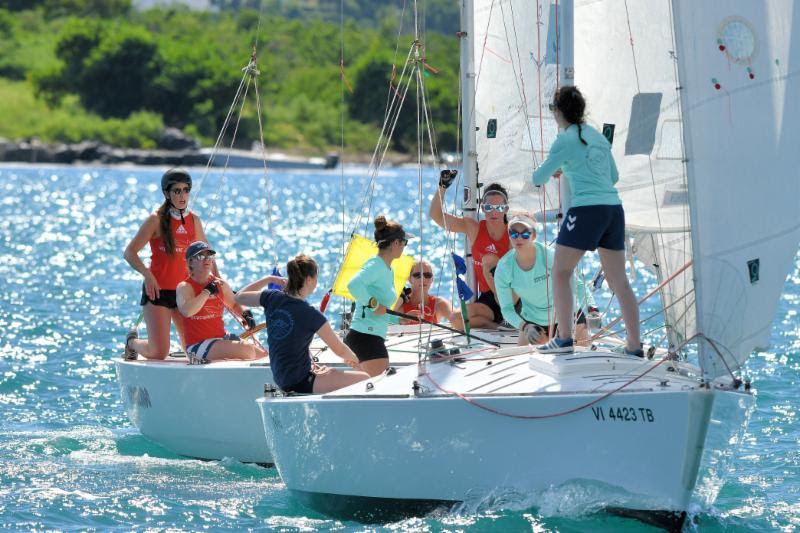 As such the event hosts the CAMR Youth Regatta, which will take place on Saturday starting at 11:30 a.m. Members of the Boys & Girls Club of St. Thomas, who have also been enrolled in the Marine Vocational Program, will crew for the women match race skippers in a best of three fleet race. The 2018 CAMR is sponsored by the V.I. Department of Tourism, Virgin Islands Olympic Committee, Virgin Islands Sailing Association, Heineken and Captain Morgan distributed by Bellows International, Patron distributed by Southern Glazer’s Wine & Spirits, Auven Therapeutics, INOVB LLC, St. Thomas Yacht Club, Antilles School, IGY Yacht Haven Grande, Storage on Site, Prior Family Foundation, Theodore Tunick & Company, Budget Marine, Bolongo Bay Beach Resort, Emerald Bay Beach Resort, VInow, Island Business Graphics, XO Bistro, Anonymous.